Joseph Suss Oppenheimer (1698-1738), better known as Jew Suss, was a court Jew, who advised the Duke of Wurttemberg. Clever and handsome, even ostentatious, he fitted easily into court life, despite his humble origins. However, his unpopular economic policies made him enemies and when the Duke died suddenly Suss was arrested, convicted of 'destestable abuses' and exectued in Stuttgart in an iron cage. His spectacular rise and fall inspired a media outpouring in the eighteenth century and he has been much written about subsequently. In the twentieth century two films were made about him, one British in 1934, the other German in 1940. Goebbels took an active interest in the latter. After the war its director, Veit Harlan, was tried for Crimes against Humanity for having made the film. Despite his acquittal, the film's association with the Holocaust remains controversial to this day. 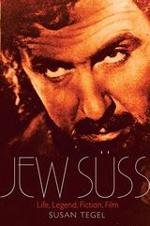 For almost three centuries the life of Jew Suss has been adapted, distorted and transformed. This book tells the story of these transformations.